The Ontario Public Service Employees Union represents more than 130,000 members. About a third work of those members work in a variety of health care settings, including hospitals, long-term care homes, ambulance, home care, mental health, independent diagnostics, community health centers, public health, and Canadian Blood Services. We were the first union to sign up members at a Ontario Family Health Team. We also represent health professionals in the province’s corrections system and Ontario Public Service members at the Ministry of Health and Long Term Care. As a result we believe we have a unique 360 degree perspective on health integration. 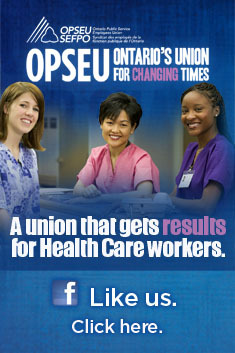 OPSEU was among the first trade unions to warn of impending issues with the Local Health Integration Networks (LHINs). In 2006 we warned that the LHINs would be used to deflect public criticism from the real decision-makers. That not only came true, but did much to damage the brand of the LHINs. The Ontario Hospital Association must be finally feeling the pinch of fiscal restraint and so-called “funding reforms” that have worked against their bottom line for at least the past four years. The OHA is asking that the government begin doing capacity planning – forecasting the specific need for a full range of specific health services. That not only includes forecasting the need for hospital services and beds (including types of beds), but also includes (but is not restricted to) a provincial needs assessment for long term care, assisted living, home care, primary care, and mental health services. The ask was part of a rare Saturday press release, itself a follow-up to the OHA’s presentation to the Standing Committee on Finance and Economic Affairs last Thursday. No doubt the OHA sees capacity planning as the first step in getting them out of the stranglehold the province has placed them in with declining real funding. The OHA has seen freezes in base funding for the past two years, and the two years before that funding was restricted to 1.5 per cent – well below what is needed to maintain the status quo. Something is definitely off this holiday season. Instead of being invited to the usual round of parties, we’re getting invitations to demonstrations and press conferences. Instead of decking the halls we’re decorating placards. How oblivious Health Minister Deb Matthews is to this growing unrest is hard to tell, although the recent revelation that she never read the ORNGE audit suggests a shocking disengagement that likely extends well beyond that scandal. Today in Arnprior staff at the local hospital will be marching to protest ongoing shrinking services. A few more physiotherapy hours to be lost in January, some x-ray… this is the hospital that decided to totally do away with personal care workers (PSWs) as it sheds staff to balance its frozen budget. This slow striptease of staff has a way to go if the government thinks it can continue on this road to at least 2018. Today is also the day that VON PSWs in Grey-Bruce Counties go back to the bargaining table in a last attempt to avoid job action. One of the workers pointed out that a staffing agency is advertising on Kijiji for temporary PSWs. Is the VON or Red Cross Care Partners – also in a strike countdown – contemplating hiring strike breakers, or are the more affluent residents of this community seeking some interim help should all hell break loose? The classified ad says the employment agency is willing to negotiate wages, something that so far their real employers don’t seem willing to do. We went through a similar countdown last week with Frontenac Community Mental Health and Addictions Services in Kingston. They are supposed to represent this brave new world of improved community-based services that Matthews has been selling, but their agency’s base budget has been cut. In the end the workers got enough for their bargaining team to recommend a deal – it has yet to be ratified. This is one of the agencies that’s supposed to pick up the slack from 60 full-time equivalent jobs departing the local psychiatric hospital. That’s clearly not happening. Next week we are travelling to London not for eggnog, but to talk to more mental health workers who have seen their clients similarly betrayed by this phoney health transformation.